Microsite templates from Microsites Factory allow targeted sales campaigns to be quickly implemented. Our templates support finance campaigns, campaigns based on make/model, and your dealership brand. Templates support Click-to-Call and Live Chat technology, helping to increase lead conversion. 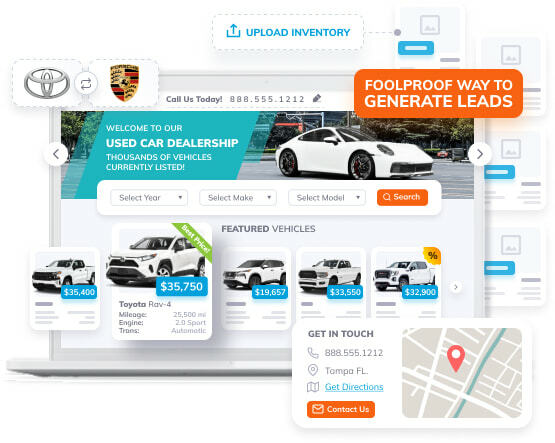 Where is your Dealer website rank with the thousands of Dealer websites online? Our Automotive Dealer Microsites target your customers by developing vehicle specific, finance or marketing campaign microsites. Our microsites drive more targeted traffic, even comparing with the main dealer website. With every microsite, we include our automotive SEO services. Microsites are typically made up of 1 to 5 pages and can be promoted independently through traditional media and search engines. You can gain high organic Google ranking and/or combine microsites with Pay-Per-Click (PPC). Our dealerships are getting first page Google results in weeks, not months!